What is important is that the weak number was driven by the construction, where employment fell 31,000 after a 53,000 increase in January. This is not the result of the government shutdown. The only consolation is that there were positive revisions of job gains in December and January. With those, employment gains in these two months combined were 12,000 higher than previously reported. 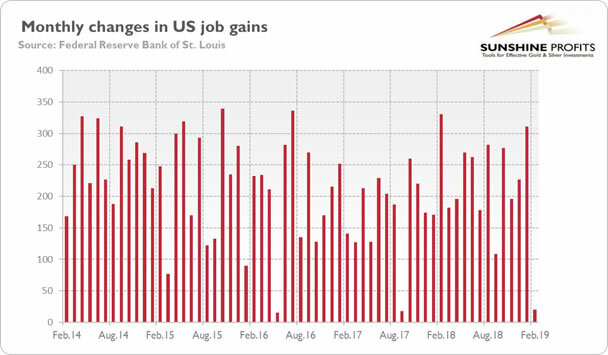 In consequence, after revisions, job gains have averaged 186,000 per month over the last three months, still above the level that would tighten the labor market further. Indeed, the unemployment rate dropped from 4 to 3.8 percent, as the chart below shows. It reflects partially the return of federal workers who were furloughed during the partial government shutdown, while the wages increased 3.4 percent over the year, the biggest gain since the end of the Great Recession. 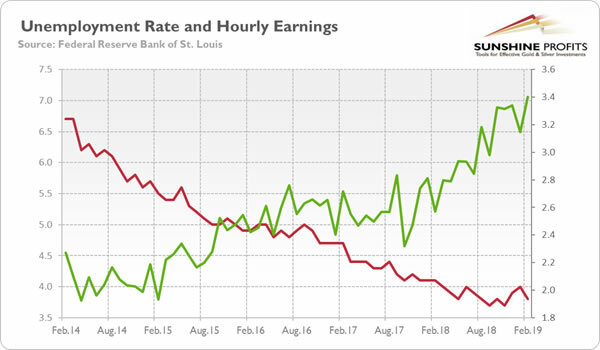 Chart 2: Unemployment rate (red line, left axis, in %) and the average hourly earnings (green line, right axis, in %) from February 2014 to February 2019. Hence, although the weak payrolls headline seems to support the dovish camp within the FOMC, the acceleration in wage inflation could lead the Fed to rethink the pause in hiking and resume the tightening of its monetary policy. Tightening can take many forms: be it continued interest rate hikes or putting to sleep the speculation of shelving the ongoing quantitative tightening program which drains liquidity from the system. It is not a good news for the gold bulls. And what about other economic reports? Let’s start from the inflation. The consumer price index climbed 0.2 percent in February following three straight months of no change. However, the CPI slowed from 1.52 to 1.50 percent on an annual basis. The core CPI, which excludes food and energy prices, also decelerated. The monthly index rose merely 0.1 percent last month, while the yearly increase slowed from 2.15 to 2.10 percent, as one can see in the chart below. The muted inflationary pressure will prevent the yellow metal from rallying. However, the Fed may remain patient for longer without the build-up of inflation, which should support the gold prices. 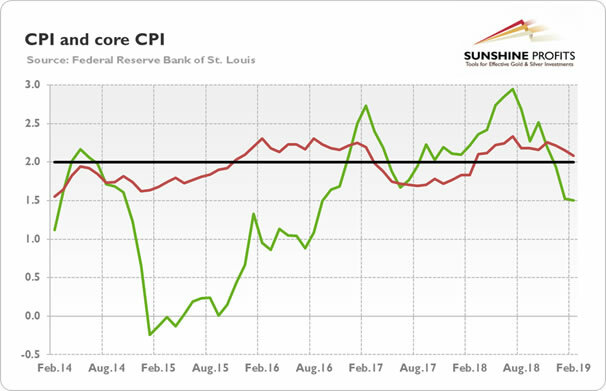 Chart 3: CPI (green line, % change y-o-y) and core CPI (red line, % change y-o-y) from February 2014 to February 2019. When it comes to other recent data, the retail sales rebounded slightly in January, after a big drop in December. But they remained muted. Moreover, industrial production edged up 0.1% in February, below the Wall Street expectations of a 0.4 rise. It was the third weak report in a row, and the second when manufacturing component declined. The US economy has recently slowed down. Some pieces of economic data are disturbing. For example, the labor market added only 20,000 jobs in February. However, the unemployment rate declined, while the hourly wage increased. One poor report should not set off alarm bells, especially that it could result from mismanagement of seasonal adjustments. The key is how the new data will affect the Fed policymakers’ forecasts. For us, the US central bank should be more hawkish, as the trade wars softened, while the stock market rebounded. With bated breath, we’re waiting for the fresh dot-plot to be published also on Wednesday. It is very possible that the FOMC members will align their outlook for the federal funds rate with the pledge of being patience. Gold may gain, then. There is, however, a question of the scale. A lot of analysts may overestimate the dovishness of the Fed policymakers – after all, they were talking about the global crosscurrents, which have softened recently, not about the slowdown in fundamentals of the US economy. If Mr. Powell fails to please these dovish expectations, gold may struggle. Anyway, we should see no change in the level of interest rates and the patient approach. Instead, we should see an increased volatility in the gold market. Precious metals investors should also remember about the Brexit talks scheduled this week. Stay tuned, we will cover all key events and their implications for the gold market in the upcoming editions of the Gold News Monitor!